Home > Grain > Strike whilst the iron is hot. 27 Apr Strike whilst the iron is hot. 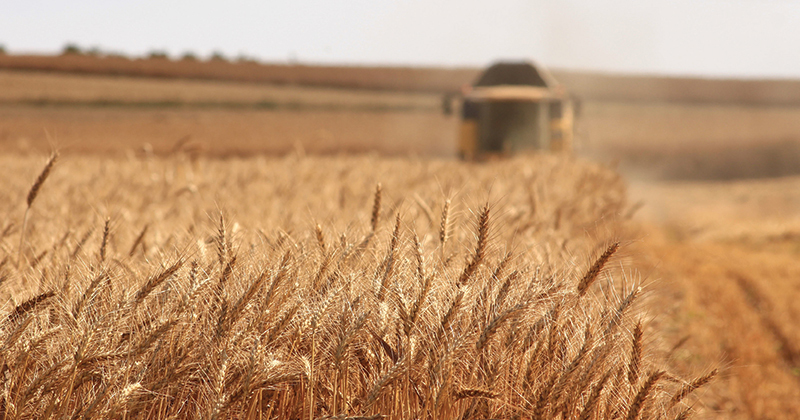 The wheat market has regained some of its strength on the back of fundamentals. This is great timing as we start to plant the crop for the coming season. In this week’s comment, we look at the SRW/HRW spread and the iron ore market. The wheat futures market has improved over the past two sessions, to return to the levels from mid-Thursday last week (figure 1). The trade continues to be concerned about weather conditions in the US, both with the winter crop, and potential issues with spring crop planting. In Texas, Oklahoma and Kansa, drought ratings remain severe (see map). The continued drought conditions have started to place a premium on the HRW grown in these areas (figure 2). The spread between HRW and SRW has been very narrow in recent years but have now started to branch from one another. Many will remember the same happening last year with MGEX futures, heading to a massive premium over SRW/HRW. The Australian dollar has continued to remain strong at a range between 76¢ and 78¢, for the past two months. In the past week, an upsurge in crude oil prices, has flowed onto the iron ore market, with an expectation of increased demand. 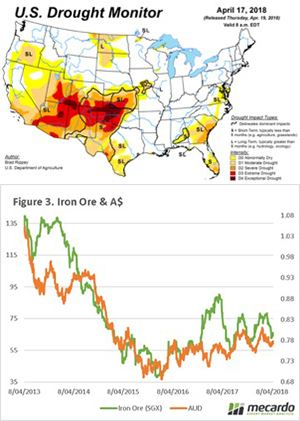 In figure 3, Singapore iron ore futures are illustrated alongside the A$. We can see a relationship between the two, which points towards a strengthening of the A$ if the iron ore rally is sustained. A rise in the A$ will make our export products less attractive, however on the flipside will in theory make our imported products cheaper (fertilizer/chemicals/machinery). The situation in the US is poor, and the further we get through the year with sustained drought conditions the less likely they will have a reversal of fortunes. The question still remains, with huge global stocks, how far can the market go?